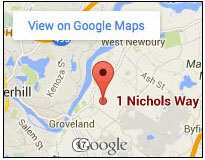 Nichols Village is anchored upon a hilltop in Groveland, Massachusetts surrounded by over 90 rolling acres of woodlands and fields. Unique in creation and design, our retirement community strives to provide independent living offering 78 apartments and 16 cottages with bountiful amenities and services to those 62 years of age and better. As you envision your new chapter in life, we invite you to explore our website. Then visit our thriving senior community. For more information, please contact us.